As much as I admire the guys and girls who make up our police force, the ambulance service and the fire brigade, I have to admit to never having been envious of their jobs. I certainly don’t have the patience, the caring nature or the bravery required to be a good police officer, medic or firefighter. I’d much prefer to be sitting in the safety of the confines of an office taking the calls and directing those on the front line to various crimes, medical situations and out of control fires. In fact, the role of an emergency operator suits me right down to the ground. But even though I have interest in taking calls from the public, trying to defuse potentially volatile situations and deciding upon the best course of action for our boys and girls in red, white and blue, I’ve got a hard time trying to work out if that vital job could deliver enough entertainment for the basis of a videogame. 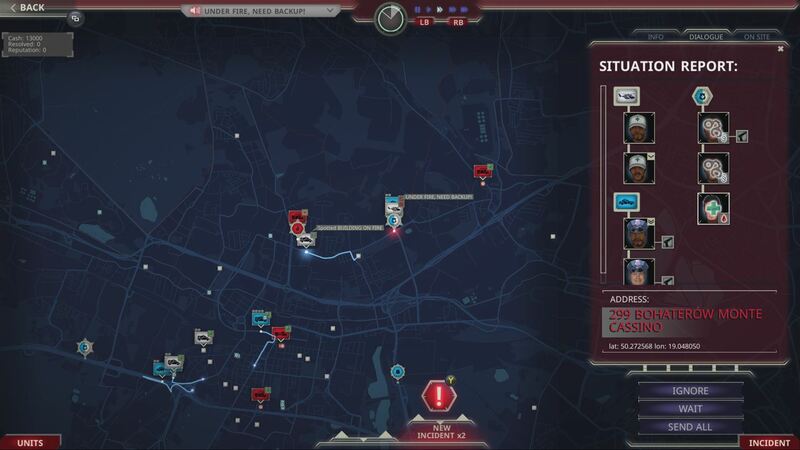 Can 911 Operator really make it as a ’game’? Or is it just a teaching tool? Well, the small development team at Jutsu Games certainly thinks there is a game in hand, but after spending some good time in the role of an emergency coordinator, I’m not too sure whether they’ve totally succeeded. It must be said though, they’ve included a whole ton of informative medical and 911 related tips in order to make the world a better place. Gameplay wise and granted, they’ve nailed the operational side of this job down to a tee, as much of your time fielding calls from the general public will see you taking both genuine and prank calls. How you respond to these however is completely up to you. You can be deadly serious as you try to get to the bottom of a murder, or you can sit back and play along with the randomness of some of the less serious calls. The dialogue options are decent – at least for the first couple of hours before things start to get super repetitive – and the situations you’ll find coming through the red emergency phone are pretty lifelike. The voice acting may not be the greatest, but you’ll be found fielding calls from drunks who are usually best left alone, to directing the fire service to the nearest cat up a tree and sending the entire police force – fully armed – to a hostage situation. There’s a bit of everything in between those too. 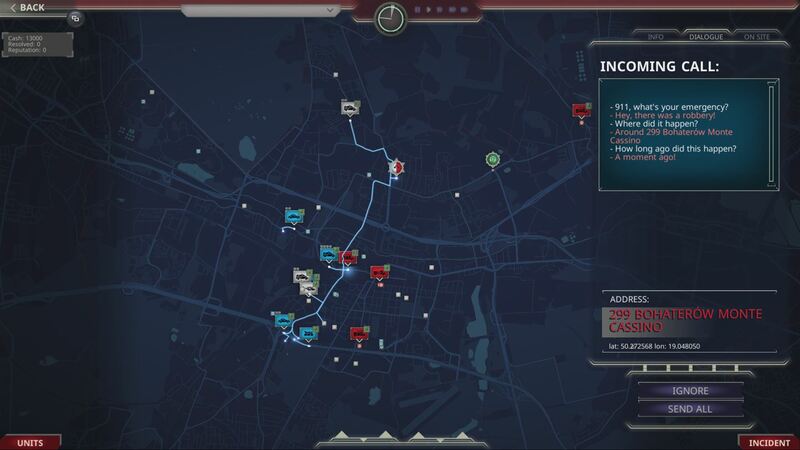 The vast majority of the gameplay found within 911 Operator is centred entirely around a map screen which gives an overview of all ongoing incidents and unit placements. A quick selection of a police, ambulance or fire unit will allow you to decide who gets sent where, whilst a press of your controller bumpers will speed up or slow down time as you see fit. 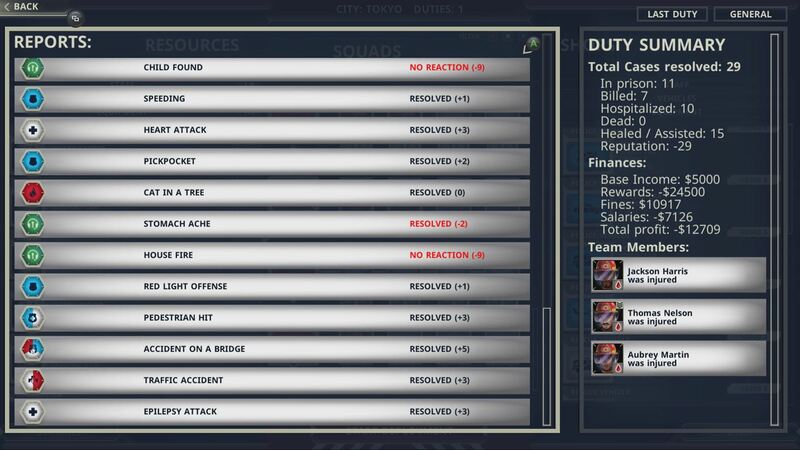 As you would expect in a game that portrays a 911 operator’s job, this is highly unrealistic but hugely beneficial. Each incident is well detailed and should you wish to succeed in your job, gaining city cash and reputation points in the process, you’ll need to send the correct units to the correct job in a speedy time. Points are rewarded for every single incident and 911 call that comes in, and should you be found slacking, will see your progression through the different city types disrupted. 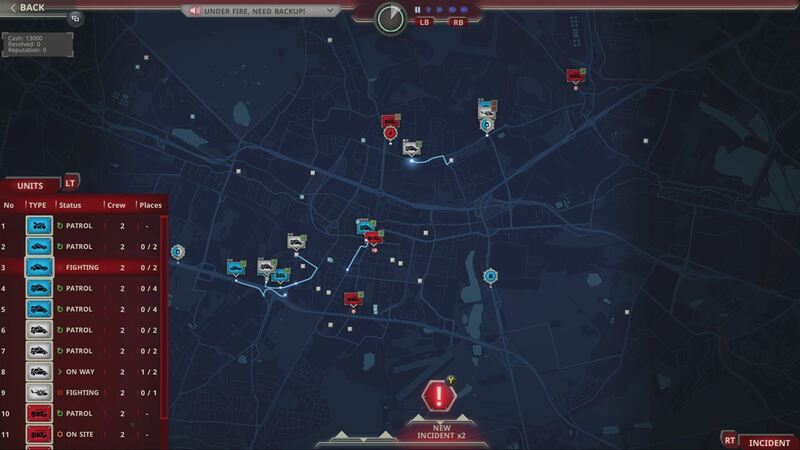 On the whole though, it’s a reasonably straightforward task to pick up and point units around the map, and even though it’s nice to read into the intricacies of each incident, 911 Operator falls short of delivering enough variety to ensure you’re still reading those details a couple of hours down the line. In fact, you’ll eventually just find yourself staring at the map and pushing units to incidents as and when they show, instead of actually bothering to find out what is really going on. And that’s a shame, because by doing that you lose all enthusiasm and love for what and why you are actually doing it. The 911 calls that come through the emergency phone work a little differently, in that you’ll need to weigh up the pros and cons before sending units out. There are plenty of pranks and tons of humour included, but alongside that are some deep, rather thoughtful and heartfelt stories. It’s just a shame that the same old conversations crop up time and time again – I had the same bloke murder his wife three times in the space of a few short minutes, even though the police had dealt with him the first time round, whilst another guy had chopped his leg off twice in the same shift. Perhaps he was unlucky, or perhaps it just highlighted the lack of depth to the conversational dialogues that 911 Operator deals in. 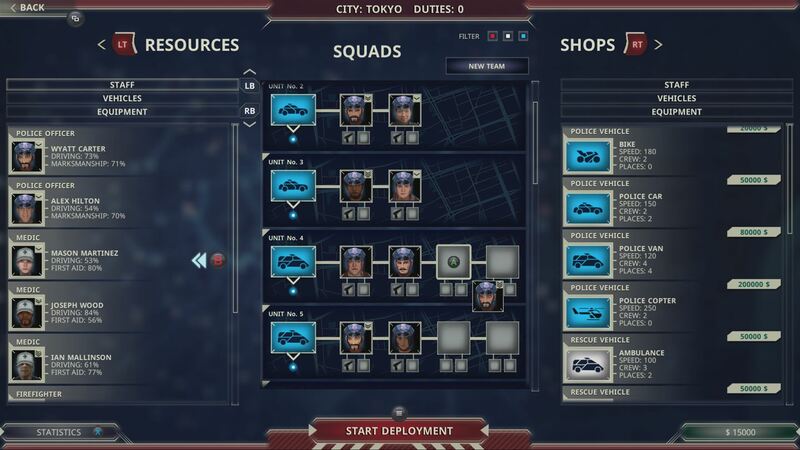 It is this repetition which takes a massive hold over 911 Operator, and what begins as good strategic fun eventually turns into a bit of a grind as you make your way through the six cities included in the main campaign. Granted there are multiple calls of duty for each city, and there is nothing to stop you heading in time and time again to try, but there just isn’t enough variety to keep you playing long term. Should you wish to go deeper though, and the Daily Routines option delivers a more realistic, longer campaign to that found in the default Unique Stories. Should you manage to make it to the end of your shift and come out the other end in one piece, then before you next head back into work you can spend a bit of your earned cash from previous shifts on new police officers, medics, firefighters, vehicles and equipment. The latter may not seem needed initially, but it won’t be long before you’ll need to ensure that your police force are fully kitted out with weapons, your medics have the correct first aid kit and your firefighters go to a job with their own special tech at hand. I’m not saying that Chicago or San Francisco are tough places to be an officer, but without the odd bulletproof vest and rifle in place, you’ll find yourself sending units to near certain death. Unfortunately the way you go about choosing your squads for the next shift, and what vehicles they’ll be sitting in, is highly frustrating. Navigation is slow and cumbersome with a combination of triggers, bumpers and thumbstick presses giving you the chance to move around. Thankfully there is no time limit on this piece of the action, and there is certainly nobody’s life in danger as you pick and choose your squad, but still it’s not the most fluent of control schemes and is a pain to use. The controls whilst you are in the game proper are better, with a simple press of the A button selecting and moving your units. Again though whilst it’s not the best system I’ve ever seen included in a game and it’s all too easy to point a unit to a job, and then accidently send them off in the opposite direction again, it does the job intended. Similarly if you send multiple units to a specific incident – you’ll want multiple officers attending scenes with hostages and guns – then it’s tricky to pull one out again when all hell is breaking loose on the other side of town after an earthquake. Once you’ve just about worked your way through all the set scenarios of the Unique Stories and Daily Routines, then you’re left with a Free Play option that does more of the same. There is however a rather lovely twist and that sees you being able to drag in the map of near on any city in the world. It’s quite the delight to see the option of being able to drag in your home city and send troops around roads that you grew up on as a kid – even if if is slightly worrying to hear of multiple murders, drug deals and shootings taking place in your home town. But once you’ve spent time messing around on the streets, you’ll find that is about your lot for 911 Operator. The price is a bit hefty, but it’s a clever idea that most definitely teaches you the way of the world, never letting you take things for granted. Unfortunately the awkward control scheme and the hugely repetitive nature will see you getting frustrated once the initial draw has worn off. That isn’t helped by some fairly basic visuals – although to be fair, they don’t need to do anything spectacular – and some audio which brings dodgy acting and little in the way of scene setting. All this combined fails to let 911 Operator ever really shine. By all means give it a shot if you fancy something a little different, but don’t expect to still be playing it days or weeks down the line. Next articleExclusive interview with Martin Korda as he speaks about FIFA, Destiny and Fable!